Home » Emporium » What’s new in the shop? We’ve added several new items to the shop and selected a few highlights. 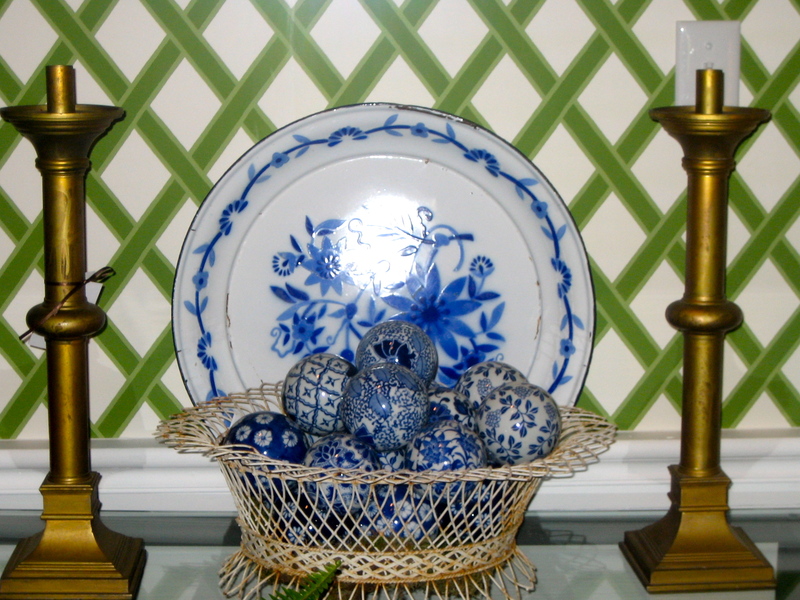 First, a French wire basket circa 1890, filled with blue and white porcelain balls. These are in our garden room and would make a charming addition to a sunroom. 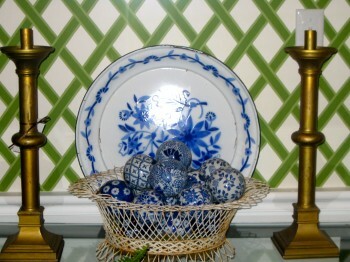 The French wire basket is priced at $275.00 and the blue and white porcelain balls (there are 18) are priced at $160.00. At a recent country auction we were fortunate to pick up an English copy of a 1750 kneehole desk in burl walnut and inlay. 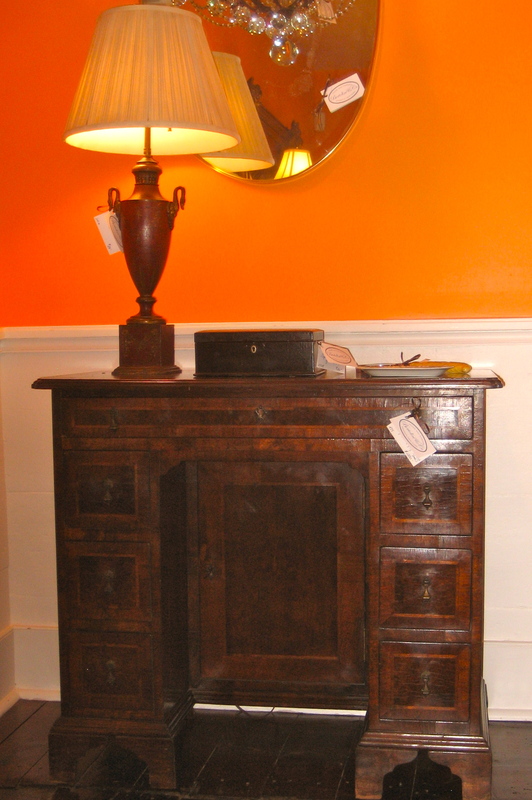 Probably around 100 years old this versatile piece would be at home in a bedroom, study or living room. 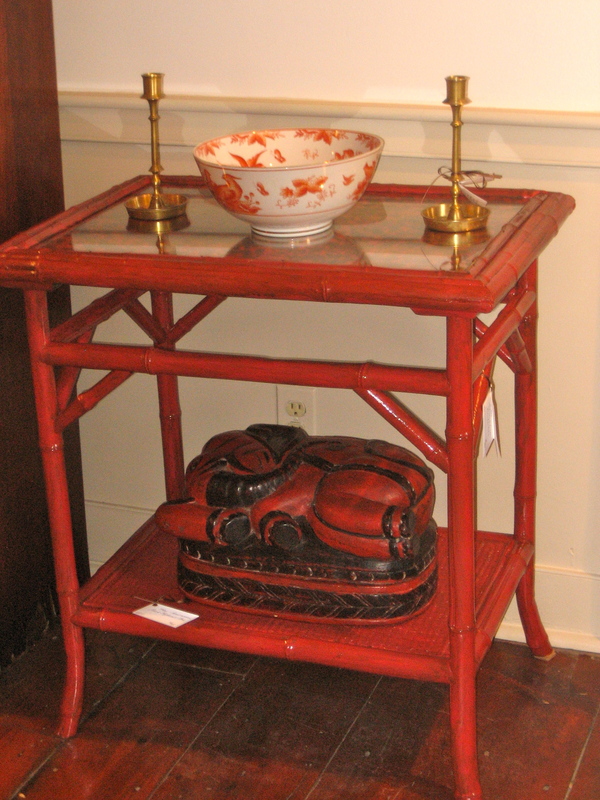 One of our favorites is this red lacquer bamboo table. We believe this piece is from Liberty in London, probably produced around the turn of the century. The glass top displays a faux tortoise finish. Use it as a drinks table, small serving piece or just a wonderful side table. 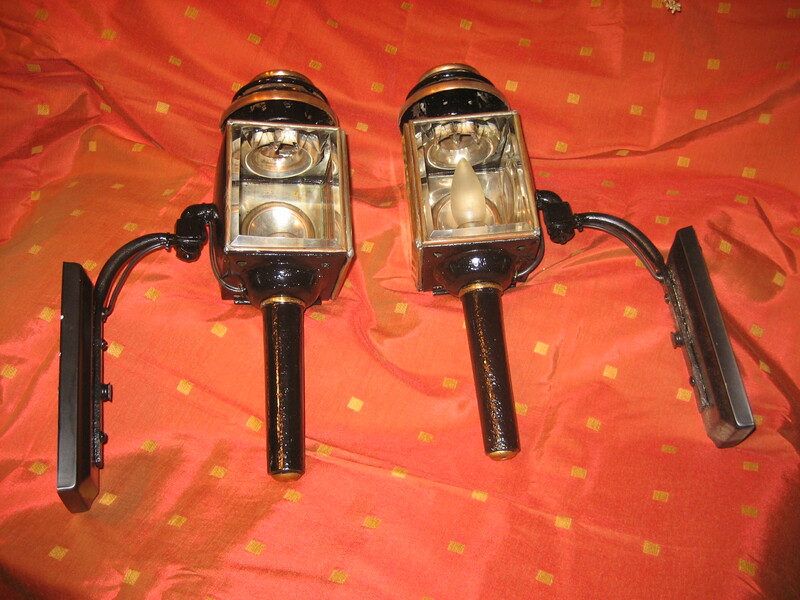 This morning a great pair of 19th century English coach lamps came into the Emporium. They measure 15 inches long by 8 inches deep. We’d love to see them lighting the way to your front door. They are priced at $650.00 for the pair. Today we had our workshop upholster the wall in the shop’s office. 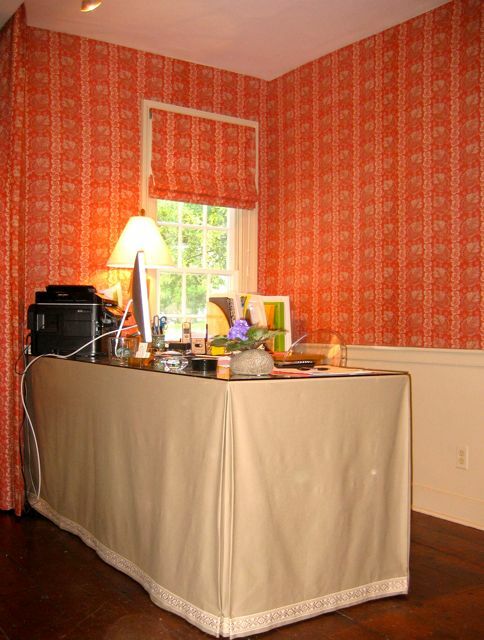 The fabric, which is also used in a roman shade and ceiling to floor panels, is from Stroheim & Romann, an exclusive hand screened design called “Woodbury”. We specialize in upholstered walls. They are perfect for a bedroom, dining room or foyer. Especially successful in an apartment, they are helpful in noise abatement. Our upholstery workshop recently finished a loveseat that we had reupholstered in a Stroheim and Romann khaki twill fabric with self-welt. 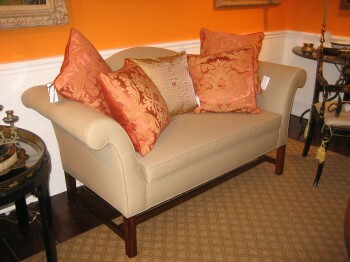 Setting off the loveseat are Italian silk pillows priced from $120 to $145 each.